Unlike the previous article on humility where there was a limited amount of nursing articles on the topic, there was an abundance of information about servant leadership in both nursing and Christianity. Then why write one more article? First, leadership is part of the RN role. No matter what the education, nor the job description RN’s are leaders as defined by many state practice guidelines. Second, Christians are to be leaders, specifically servant leaders. We are to exemplify Christ with our work, home, and community life. So naturally, for the Christian nurse, we are servant leaders wherever we work and whatever our job title. Check out the article in the Journal of Christian Nursing and let me know what you think? Humility: A noun, an adjective and a verb? As I looked at discussing humility as topic for Christian Nursing 101, I had to start from zero. I knew very little about humility personally and professionally and hadn’t heard the church discuss humility. In fact, it was hard to find articles and books discussing what humility is and what it is not. The problem is we may have heard a sermon, here and there, but no great in-depth discourse nor Bible study on how to be humble. Especially when compared to topics on leadership, love, caring, courage, and others which fill the bookstores and sermon lists. From these deficits in our Christian faith and in nursing, as well is in my own personal/professional life, I decided a discussion on humility was needed. and then spend some time tin prayer and self-reflection in how to bring humility to both your personal life and your nursing practice. Don’t be too hard on yourself. Humility, like faith is a growth process and we will spend our earthly lives gleaning attributes from our Savior. Just take note where you would like to improve and then allow the Holy Spirit to direct you accordingly. First, I will go on the record to say…I am late with this blog entry. My life has gotten away from me and I am trying to get back on track. As a a Christian professional you may have asked, “What is the difference between mentoring and discipleship?” Mentoring is tailored for professional development from a more experienced colleague. Discipleship, like mentoring, uses the process of experience guiding the less experienced (Paul & Timothy in the NT is a great example. But, the focuses is on the spiritual maturation of the individual. Many Christians may have or have had a mature Christian guide them in the early years of faith. 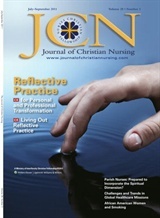 The article Fostering Future Nurses in Journal of Christian Nursing discusses how Christian nurses can merge discipleship with mentoring for a caring, committed relationship to guide future professionals in cultivating a Christian nurse. 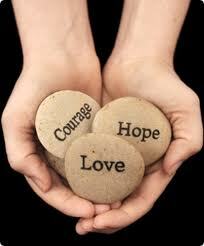 As an experienced nurse, I have had great mentors guide me as a professional nurse. My first mentor was a nurse I worked with in the hospital who really cultivated my critical thinking. When I left the hospital to teach, I told her it was because of her guidance that developed my clinical judgment and led to my move to academics. My next mentor was an excellent professor who was first my teacher then a colleague. She really gave me a solid foundation for teaching/learning, curriculum, and academic leadership. How about you? Share your great nursing mentors…I look forward to hearing from you! As Christian nurses we can experience the Presence of the Holy Spirit. This is more than just attentively listening and communicating with a patient as with “being present.” This is being used by God to connect with patients. The Holy Spirit’s indwelling is a wonderful blessing and part of our relationship with Jesus Christ. It is also how we can connect with others as part of God’s work in their lives and our own. One such special time was with a difficult patient. I was struggling to feel like my work as a med/surg nurse really mattered and that I was being used by God. One day a call light came on for a patient that I was not assigned to, but new very well. He was considered a “frequent flyer” because of his chronic disease and difficult behavior. I was prompted by the Holy Spirit to answer his call light, which I did. That moment began a long relationship of seeing this patient beyond my med/surg nurse eyes and heart. I knew the Holy Spirit was intervening for this man, because my eyes and heart were opened in a way that I could not of otherwise seen. Actually, one of my indicators now, that the Holy Spirit is working in my heart, is when I notice, see or feel things that are beyond me or outside my normal feelings. I would enjoy hearing your stories of how you experience the Holy Spirit in your work. Read the article: Presence in this month’s JCN. There I give a great example of the difference between “being present” and the Holy Spirit’s presence in nursing. There is also a snap-shot of the Bible’s teaching on the unique person of the Trinity, called the Holy Spirit. This conference looks like it is going to be a great place to hear from wonderful Christian Nursing Experts!